via: Owen Bay Sonora Island, Open Bay Quadra Island, Tribune Bay Hornby Island, Nanaimo Harbour Vancouver Island. So, I have been a little lazy with the blog these past few months, and now that boating season is just about here, I thought I would finish up last years posts and the move on. Coming south through Johnstone Strait, you just never know what you will see. This is the first time we have seen Orca so close, although apparently they are quite common. This group of three was part of a larger pod of maybe 15-20, and they came within about 30 feet from our boat. Very exciting to say the least, I love seeing these beautiful animals in the wild. We did not run into any fish nets this time, and we really kept a close watch for them. The rest of our trip home was uneventful (possibly why I haven't posted anything! haha), but absolutely beautiful weather all the way. We tried crabbing in Nanaimo Harbour (Steve said we would catch some), but came up empty. We are currently getting the boat ready for this summer's trip..... Haida Gwaii for a month. We are leaving at the end of June and will be out on the water until early September. 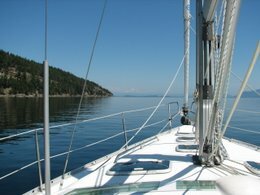 I will try my darndest to keep you posted, I do have some posts ready, so keep a watch on our blog if you are interested in boating.